The City of Saint Augustine, Florida is the longest continuously occupied European settlement in the U.S. This popular retirement community was established in 1565 by the Spanish. It has been under 4 flags – Spanish, English, Confederate, and U.S. – and some of these (Spain and U.S.) more than once! 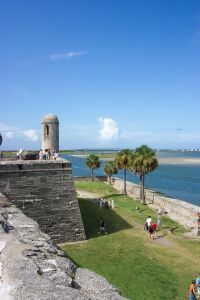 Located on Florida’s northeast coast and southeast of Jacksonville, Saint Augustine has about 12,000 residents. The area is well known for its fabulous beaches and public golf courses such as St. John’s Golf Club. This diverse city has a mild winter climate. 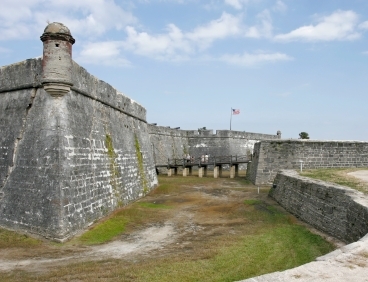 Several Spanish Colonial Revival Style buildings from the Spanish era still exist in the city, most notably the 1672 fort by the Spanish, Castillo de San Marcos National Monument. Henry Flagler helped build St. Augustine into a winter resort for the very wealthy. Some of the mansions and palatial hotels from this period still exist and have been converted to buildings at Flagler College and in several museums.